With all the cold weather settling in the past month or so, people are asking, "where's the snow?" The big snows at least. Well, the next best chance will arrive Sunday into Monday. While it is not advantageous to post a winter weather forecast 5-6 days out, confidence is above average during this time frame. 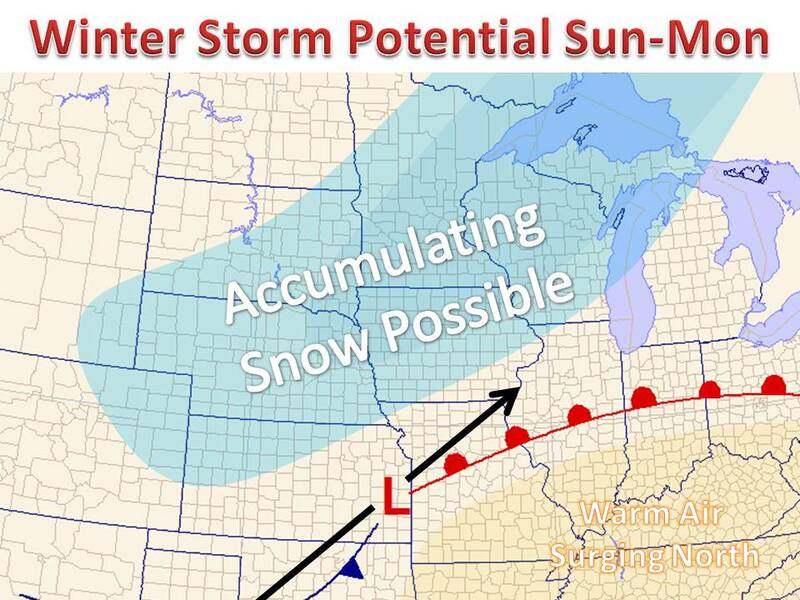 The edge of accurate winter storm evolution forecasts across the Midwest is usually around the 5 day time frame. However, the difference in this case is the method of storm development. Models have consistently shown a large price of energy coming on-shore the West Coast Friday and pushing due east through the weekend. As this energy emerges on the lee side or east side of the Rocky Mountains, significant cyclogenesis is expected. In many case, including this winter, there are multiple pieces of energy that the models need to resolve and issues in accuracy arise from sampling and future progression differences. Nevertheless, the expectation is that an area of low pressure will move from the Central Plains towards the Upper Midwest Sunday into Monday. Heavy snow is expected to fall to the northwest of the track, 6"+ of snow is possible, but it's simply too early to get more specific. Keeping in mind, we are still 5+ days out, there is some uncertainty in the exact track. Below is a look at the GEFS. It is a model that is ran 20+ different times at a lower resolution with slightly different inputs to quantify error. The individual red numbers are low pressure locatations and are where the storm may end up. Notice the spread is still from southeast MN to northern IL, with the reminder that the heavy snow will fall 50-200 miles northwest of the where the low tracks. Lots to work out over the next several days, so check back for updates when necessary. Be sure to follow on Twitter and 'like' on Facebook.